“Maggie” came to our office with a problem. Three months prior to visiting Navarro Dental Group, Maggie had previous dental work performed at another dentists office. 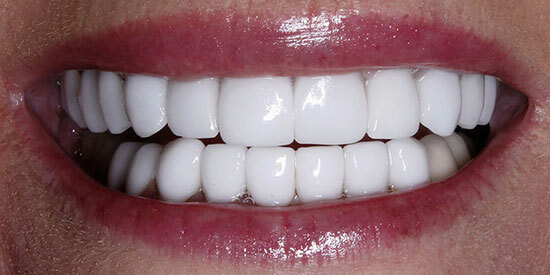 Dr. Nick was able to quickly diagnose and recognize that not only were her teeth flared, her midline was far off center, and the teeth were poorly shaped for her mouth. As Maggie’s lower teeth were never redone, they too required reconstruction. Despite the full scale of the process, we were confident that Maggie’s goal of a beautiful Hollywood smile would be met. Within a few short months, Dr. Nick Navarro was able to recreate and reconstruct her entire mouth. Through the use of diagnostic wax ups, meticilous measurements, and study models. 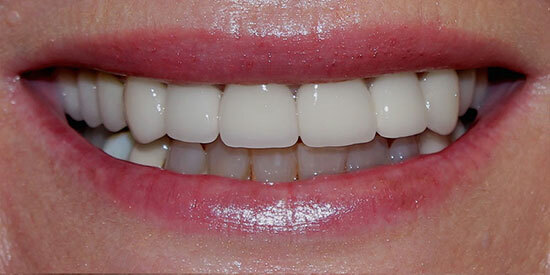 Her mouth was fully restored with the use of individual porcelain units, and her feminine arch was retained.